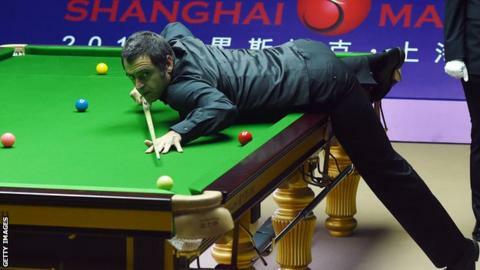 Five-time world champion Ronnie O’Sullivan successfully defended his Shanghai Masters title with an 11-9 win over Barry Hawkins in the final. The 42-year-old world number three was playing his first event since a second-round World Championship loss in April. Having beaten Kyren Wilson 10-6 to reach the final, he was 6-4 down to Hawkins, who made two early centuries. But O’Sullivan won the tournament, which is no longer a ranking event, for a third time with a break of 122. Hawkins, who came from 9-7 down to beat local favourite Ding Junhui in the final frame of their semi-final, began with a 125 in the opening frame and added a 132 to build a two-frame cushion at the interval. However, O’Sullivan, who lost to Ali Carter in Sheffield, produced breaks of 64, 61, 56 and 113 to capture the first four frames of the second session. He won six out of seven frames to move 10-7 ahead but as the frames became increasingly scrappy, fellow Englishman Hawkins, the world number seven, fought back again and reduced the deficit to one with a run of 74. But Hawkins edged a red out with his break off in frame 20 and O’Sullivan rolled in a superb century to secure the title and pass £10m in career prize money. Sign up to My Sport to follow snooker news and reports on the BBC app.